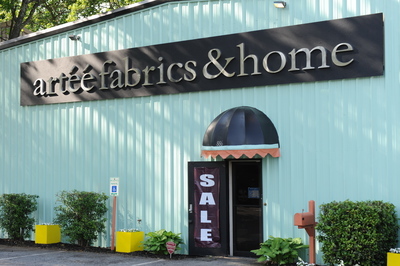 Welcome to artéé fabrics & home - Yorktown ! We used to be Arts Fabrics and are now part of Artéé Fabrics & Home. We have the ability to bring to you the lowest prices anywhere for fabrics and trims. We have a large collection of fabric on the bolt that you can take with you. No need to wait for days to receive your fabric. New fabrics in all categories have been added to our stock. Browse through the latest collections of cottons, silks, linens, blends, and polyesters; in solids, plaids stripes, embroideries and prints. You will be amazed! In addition to fabrics and trims we carry great accessories, artwork and mirrors that will complement your fabrics and will find a great place in your home or as a gift to someone special. Our store carries a large assortment of ready made panels and pillows as well. Need window hardware, no problem! We have access to many vendors of drapery hardware. We also offer custom design services. Whether you need new bedding, window treatments, upholstered furniture or just some decorative pillows to spice up your room, we can help with that. If you need an in home consult our designers will be able to accommodate you at a nominal charge that will be applied to your purchase. We look forward to meeting you in person at the store and help you select the fabrics, furniture or accessory of your choice.